Morning everyone. This is always a difficult day each year, and as I was plotting out a prayer plan of attack yesterday :) the mail arrived, and I received some beautiful reminders of our faith and the great cloud of witnesses that have gone before us. Remembering that we can call upon their prayers brought me great comfort, and I thought I'd share what I received with you all, to perk us up a bit on a very somber morning. 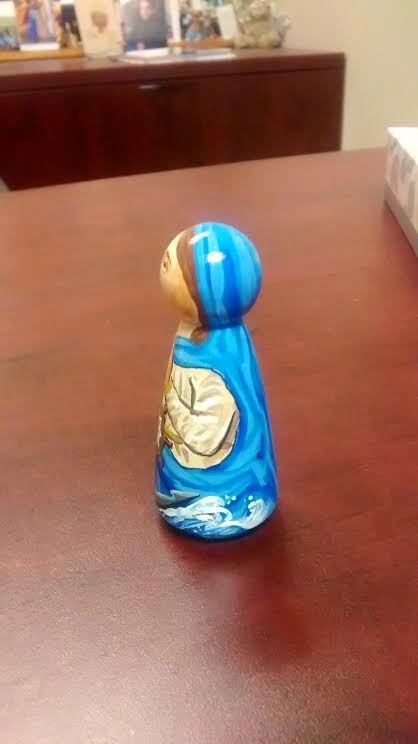 I mentioned previously that I adore saint peg dolls, and I collect them and buy them for my children. 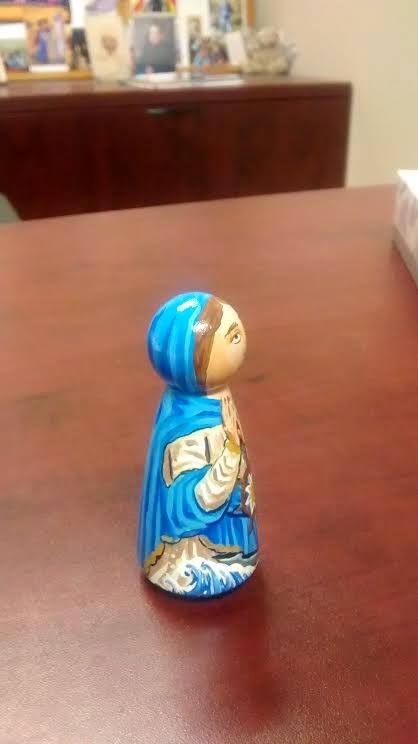 Henry, in particular, likes to display his along with the small saint statutes we seem to acquire any time we're at a Catholic gift shop. Henry is a huge fan of the saints, and I had a proud Catholic mother moment when his teacher commented to me how well he does in their religion curriculum and always contributes interesting saint tidbits at impressive intervals. I adore instilling a love for the saints into my children, and I'm so grateful that I have the opportunity to share this with them. 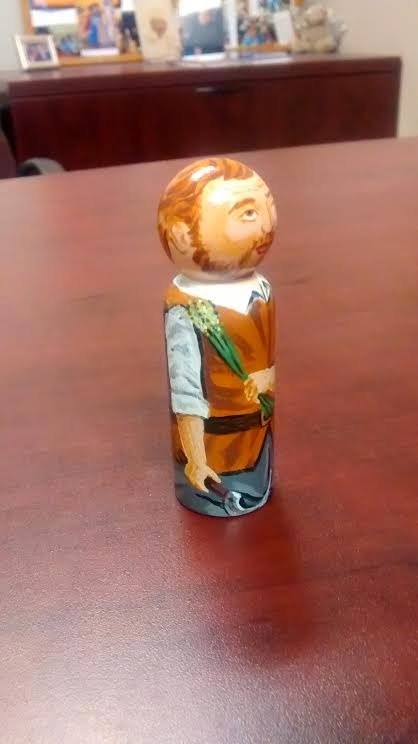 A few weeks back, I placed an order with St. Luke's Brush on Etsy for a few new saint dolls. These are the friends that arrived yesterday :) and they and I had a little photo shoot in my office this morning so that I could show them to all of you. He is depicted carrying a scythe and a sheaf of grain. The detail is just spectacular. 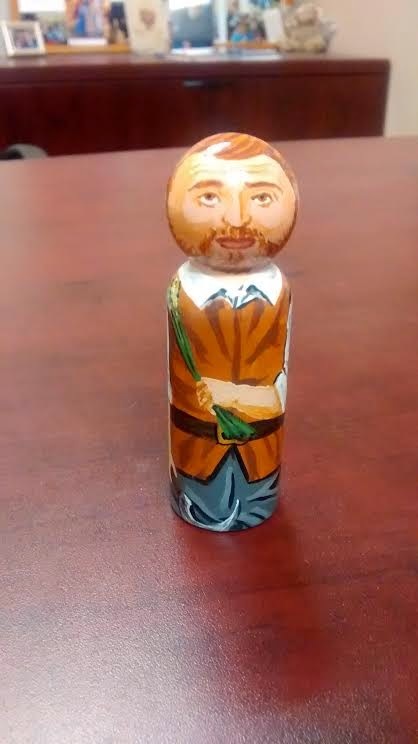 I'm so excited to give him to Henry. I am so, so pleased with the dolls. 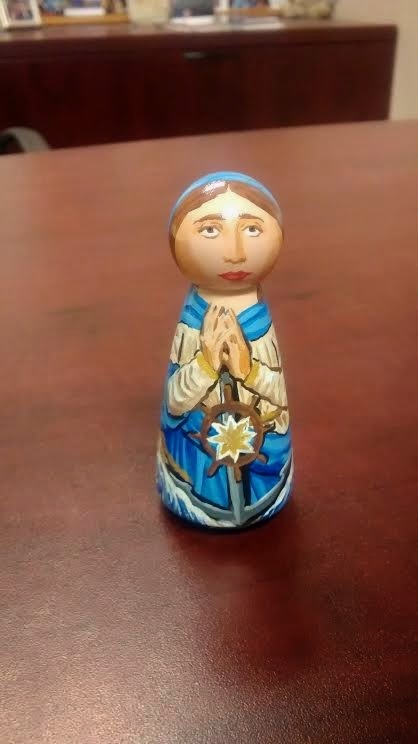 I have Our Lady Star of the Sea on my desk now, and just looking at her makes me feel soothed. Especially on a day like today, it's a wonderful reminder every time I see her to pray a Hail Mary and ask for Our Lady's intercession for peace in our world. Let us all remain in prayer today as much as possible, and ask for the intercession of our family in heaven.